If all my life leading up to this moment is a rehearsal for this moment, then this moment is also a rehearsal for what’s coming later. You can improve your brain matter at any age. You can prepare for any eventuality. I’m convinced of it. I’m living proof that, even after near-disaster, without any clue what’s happening to you, recovery from traumatic brain injury (even a lifetime’s worth) is possible. Understanding the nature of My Self as an expression of my own unique personal abilities. The constant assessment — judgement or acceptance — of those abilities both by myself and everyone around me. Repeatedly practicing my progressively developing abilities, all of which have led to further growth and improvements, strengthening and expanding my Sense-Of-Self beyond the limits it once had (even beyond the limits I had prior to my most recent injury). This thing we call our Self is specific and unique to us. It’s the part that’s unlike any others, but which makes it possible for us to connect with others. Those differences are not deficits. Not if we value them. And the overt, conscious, deliberate valuation of our differences, our abilities, is what helps us to get back to a place where we feel like ourselves again. Indeed, if you consider that differences are what make us individuals, then the changes that take place in us after TBI aren’t necessarily deficits. And they aren’t necessarily permanent. Of course, some of the changes stick around for a long time and never quite disappear. I have constant issues with fatigue, myself, and I have to constantly factor that in. I don’t like keeping to a schedule, but I know if I don’t, I’ll pay the price later — and so will everyone around me. But if we look at the changes we experience only as losses (which to some extent they are) and then get stuck in that loss, and we continue to try to get back what may be gone or changed for good, then we lose the chance to seek out new ways to be unique and individual. One of the BIG problems I have with TBI rehab — based on reports from survivors as well as videos I’ve watched on YouTube — is the focus is so often on accepting your deficits and resigning yourself to a life that is less than 100%. Less than 100% of what, exactly? How we were before? What we were before? Where’s the sense in that? From one year to the next, we change and grow, and we also experience setbacks. So, why assess yourself based on an old measurement that was going to change, anyway? Think about it. Are we ever 100% of anything? Impossible. We’re all works in progress. If we use our old life as the only measure of your future prospects — basing our current value and self-assessments on an old, outworn, constantly changing standard — we hobble ourselves and our future. Who among us ever remains the same throughout the duration of their life? Not a one. Who among us never changes, due to circumstances? Only someone who is stunted by fear or some sort of imbalance. Normal people change. We change all the time. After job changes. After major life events, like marriage, divorce, death, birth, and all those other life passages that we participate in as everyday humans. Our bodies change over time. Our personalities change, as well. But all along, we remain who we are. And so long as we feel comfortable and fluid in our self-expression, we can be reasonably sure of who we are in the world. It’s the dramatic life changes that turn us upside-down. Natural disasters that destroy our homes. War and pestilence that decimates our families. Sudden divorce. Unexpected deaths. TBI. All of these — and more — do their part to warp our Sense-Of-Self and make us strangers in our own skin. But with TBI, it’s even more intense, because you don’t have the old predictable, reliable “wiring” in place to comfort you and keep you on track and remembering who you are and what you’re about. That puts us on edge. It makes us fight-flighty. It confuses, disorients, and frightens us, triggering the limbic system and making it even harder for us to recover. The constant stress of not recognizing ourselves, not having our closest friend and our most trusted ally — our Self — puts is in a constant state of hyper-vigilance. And that impedes our ability to learn, our ability to really think things through. And that slows our recovery, sending us down one hyper dead-end after another, skewing our thinking and distorting our perceptions… even sometimes putting us in a state of mind that turns us into what some medical and psychiatric folks call “The Miserable Minority”. See, here’s the thing (for me, at least). The greatest loss of TBI is not so much about losing specific abilities or capabilities. It’s not about losing your balance or your hearing or your cool-headed resolve. The real loss comes from losing comfort with your Self — the old sense of fluidity, the sense of mastery, your longtime (and hard-won) sense of being a viable individual. It’s not the loss of specific abilities that hammers us, it’s the loss of ease and grace. It’s the loss of confidence, and the loss of our sense that We are Alright, because we can handle whatever comes along. When all that goes away, as it can with TBI, that does the greatest damage. So, given that, if it’s the loss of the feel of grace and ease and mastery which undercuts our sense of who and what we are and defines our individuality, then hell yes, we can restore a Sense-Of-Self over time. You can build that sense back. You can restore that feeling. You can get to know yourself again in a completely different light, and get to a place where you actually do recognize and trust yourself again. You might not be the same sort of person you were before, but you can still be YOU. A renewed Sense-Of-Self comes from repeated actions, practiced actions, done over and over and over again until the experiences and reactions are so familiar to us, they feel like we’ve been doing them pretty much all our lives. After 12 years of a progression of confusion, despair, disorientation, terror, rage… calming myself down, and steadily working at the basics of my life, I can tell you from personal experience that a brand new Sense-Of-Self is something we can create for ourselves, even if TBI has taken the old one away. My old sense of who I was… that person has changed. And the new version has many parts of the old, as well as many parts of the new. To be honest, I like the new “me” better. These restoring activities don’t even need to be big things. They can be small, almost miniscule things, like always unlocking the door in exactly the same way and then hanging up your keys on the same key rack as soon as you step through the door at home. A predictable routine every morning when you get up, can go a long way towards 1) helping you get off to a good start each day, and 2) cementing your new Sense-Of-Self. A reliable routine at night — make supper, watch t.v. or work on a jigsaw puzzle, then head off to bed by 10:00 p.m. — will go a long way towards stabilizing your sleeping schedule, which will help with irritability. Every time you can create a predictable routine that you follow over and over and over again, until it’s second nature, is a time you’re building back your Sense-Of-Self. And it’s a good investment of time — not a wasted effort. I can tell you in no uncertain terms, I have gained some of my greatest wins and restored a considerable amount of confidence from seemingly stupid little steps that I mastered. Things like having an exact step-by-step list of everything I need to do to get myself ready for work. Things like a daily morning exercise routine, as well as a common-sense sleep routine at night. The combination of all of those trained me to get through making my breakfast without melting down and messing up the kitchen and starting each day on the wrong foot. Even the smallest of changes, the most insignificant improvement (which everyone else seems to be able to just do), has made a difference when I did it often enough for it to be second nature. In my practice and mastery of those simple things, I found a solid footing I had lost in the aftermaths of my TBIs. Not just the most recent one in 2004, but all the others I’ve had, each of which took something from me that was a core value about myself. 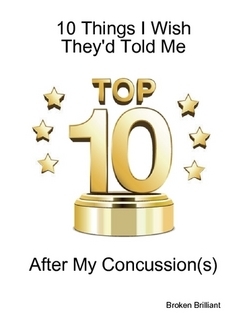 The cumulative effects of all those injuries have not been easy to to deal with. Far from it. But through the simplest of actions — making lists about what I needed to do each morning and following them until I had my routine down pat — I found my footing. Solid footing. And that set the stage for developing a level of comfort I had all but given up on. Each of these small steps, these small ways I was able to restore my sense of mastery, restored my Sense-Of-Self. Because in the midst of all the confusion and frustration and trial and error of my daily life, I was able to make good, solid starts to my days which set the stage with confidence and surety. Before I had my morning routine down pat, I started out every day steeped in the most caustic acid bath of self-doubt and insecurity. Before I figured out how to get my breakfast made without blowing up, I couldn’t get out the door and get on with my day in a sane frame of mind. But once I had the basics mastered, it set me up in a very good way for future success and future confidence. And even when everything at work was confusing and frustrating and not looking very promising, being able to go back to the basics of my life and practice them with mastery, retracing my morning routine at night, and ending each day on a stable note, did wonders for my ability to cope and just get on with it. No matter how small our actions, no matter how insignificant our new mastery may be, the fact that it is mastery, is what gives our progress potency. It’s what gives it — and us — power. The improvements can be the “littlest things” — being able to brush our teeth, take a shower, and wash our hair every morning, being able to make breakfast in such a way that the coffee isn’t cold by the time the egg and toast are ready to eat. Or they can be more complex things — being able to control our emotions when confronted by the unexpected, reading a book or participating in a conversation, or going on an extended business trip and participating fully in the experience without melting down. The main thing is how we participate and experience them. The main thing is not what we do, but how we feel. That feeling of mastery, even if it’s related to a new activity or an old activity we’ve changed, is what restores us. And if we focus on that, rather than the specifics of what we’re doing and our judgments about them, we have a chance to increase the value of those things, and come to accept ourselves and our newfound ways more than ever. Take, for example, someone who’s been hurt in an accident, and is unable to walk without braces and canes. I once met a man like that — he’d fallen 100 floors in an elevator, and lived to tell the story. He could have given up and given in, but he turned his attention to other activities — ones that weren’t dependent on his legs. He went from being an elevator inspector to being a stock market investor, and in the process he ended up much better off, financially speaking, than he’d ever been before. Even with the stock market crash of 1987, he only lost a fraction of his holdings, because he was smart and didn’t get greedy. He couldn’t walk without using two canes, but he could drive a modified sports car, and he could certainly participate in life on other levels. I doubt he would have said falling 100 storeys in an elevator was the best thing that ever happened to him, but he went on living in spite of it. He made his own life work for him. So, no matter how different we may end up, after TBI, there is always more about ourselves that we can discover. We can certainly stay stuck in our past, interpreting our every mistake as an indication that something is wrong with us, and we’re too damaged to get on with it. But the simple fact is, our brains are plastic. Our lives are plastic. We can shape and change them however we like — within reason, of course. Not a single one of us knows just how much we are capable of. And until we stop clinging to the past and decide to move on to the future, we cannot find out. We’re all — TBI or otherwise — like shards of a broken vessel, that needs to be put back together again. We can be like kintsugi pottery that’s been smashed to pieces and then repaired using gold. The finished piece actually becomes more beautiful and more valuable than it was before. Repairing our broken Selves is like that. We’re restoring a coherent sense of our whole Selves — and others — in the face of shattering circumstances, so that the light we all hold within ourselves can shine forth. When we see the light, that gold, instead of the broken pieces, and we find new ways to experience and express that light, how much more can we be, than just survivors of some terrible accident or fate? Our Selves are the collection of unique qualities we express with ease and grace. We’ve learned how to do that through a lifetime of practice, and our brains have become “wired” to understand our world and ourselves in a certain way that’s familiar and relatively easy for us. Our Sense-Of-Self is at the center of our identity and our level of comfort with the world and our place in it. That core identity depends not only on our uniqueness, but on a sense of mastery and fluidity that comes with practice of those qualities. When that sense of mastery is disrupted or damaged by a brain injury, our Sense-Of-Self is, too. We get lost. We lose ourselves in the unfamiliar pathways of our reshaped brains. Losing our Sense-Of-Self puts us into a state of constant confusion, frustration, and fear. Our most trusted guide, our most reliable friend — ourSelf — is nowhere to be found. And our daily experiences become strange and frightening to us. We can get trapped in a self-perpetuating cycle of fight-flight stress that makes it even more difficult to learn the lessons we need, in order to recover. Losing our Sense-Of-Self is perhaps the greatest challenge you can experience from a TBI. And it’s what keeps you from recovering and getting on with your life. Nevertheless, we can restore our Sense-Of-Self by achieving mastery, by become adept at things which become very familiar to us. These things can be small or large. But they all matter. Every little thing we master, no matter how easily everyone else does it without even thinking about it, is a victory. And each and every victory should have value for us and for the others who care about us. By practicing our mastery, day in and day out, we can build a foundation for our Sense-Of-Self that restores our own confidence on small but important scales. Our sense of mastery, of increasing fluidity and familiarity with positive experiences, then sets the stage for later, more complex masteries. Ultimately, we can find our way back to our Selves by expanding our definition of who we are and what we’re capable of doing. And we may just find that our new Self has abilities and talents we never would have discovered, if we’d never chosen to seek out and master them. All of us change over time, without exception. Brain injury is an extreme case, changing us in ways that are unpredictable and scary. But despite what the experts have to say, recovery is possible. Progress is probable. The changes in our Selves can be scary, but they don’t need to ruin your life. We always have the option of letting our Selves be made new again, and that’s something to be encouraged and valued. Fearing changes helps no one. Fearing differences just makes matters worse — for ourselves and others. But when we face them head-on and accept the challenges as a chance to make a whole new life for ourselves, we have an amazing opportunity to find out what all we’re capable of, who else we actually can become, and live a full life in our own unique way that can find the good in even the hardest of times. In the end, it’s not so much what life sends our way that determines our future and our comfort level with who we are, but what we do with those well-camouflaged gifts. We all have a choice, on some level or another. What will be your choice? I know what mine is.